Cue the Boys II Men song, End of the Road. The big event is here and after all the recipe testing, menu planning and grocery shopping it all comes to fruition in the big feast and soon all we’ll have remaining are full bellies, happy memories and hopefully lots of leftovers. This week has been ALL about getting you prepped for the days after. 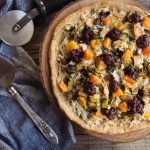 With minimal cooking and making great use of the leftovers, I want you to just keep the holiday comfort food party going and of course, I never ever want you to throw away any food! 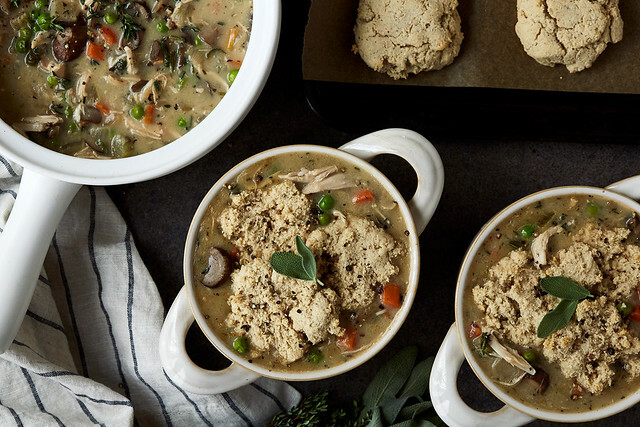 This Turkey Pot Pie Soup with Grain-free Drop Biscuits is about as good as it gets when we are talking about comfort food and leftovers. This is the ultimate and without any grains or dairy, you can feel good after indulging! 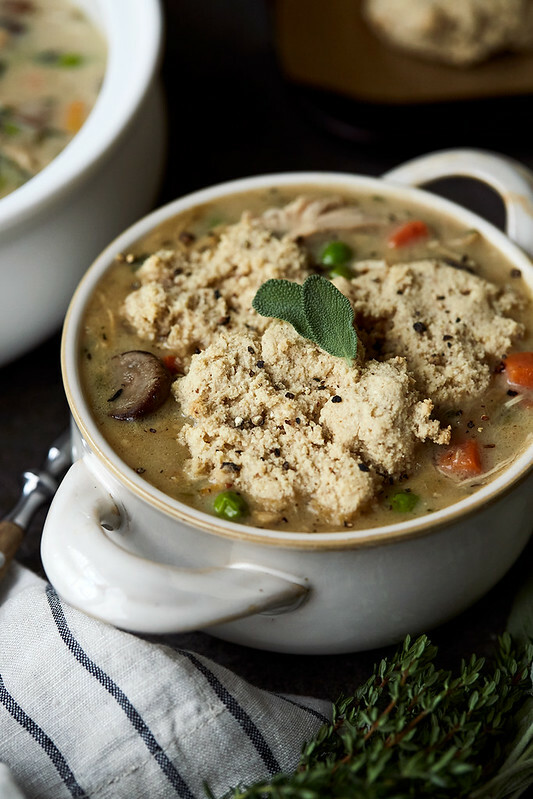 This Turkey Pot Pie Soup with Grain-free Drop Biscuits is an incredible, comforting dish that requires minimal work, it’s ready in just about 30 minutes and it’s a really great way to use up varying leftovers. Of course, I like to start with the turkey carcass and make homemade bone broth to maximize taste and healing benefits. 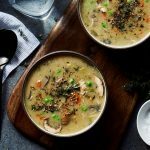 If you aren’t interested in the long cook time of bone broth, simply make it in your pressure cooker or opt for your standard broth that simmers for 3-4 hours. If you didn’t walk away with the carcass, then just use some ready-made high quality organic turkey or chicken broth (be sure it’s gluten-free). 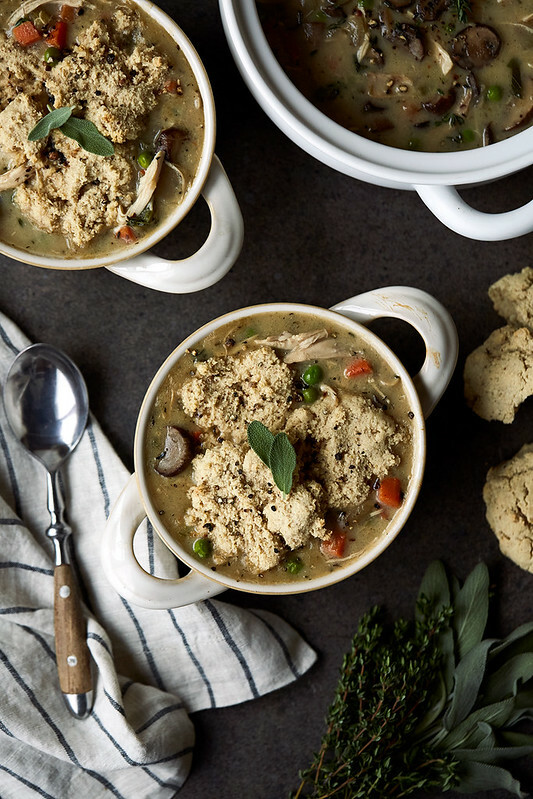 This soup can also be made with leftover chicken, just the same. 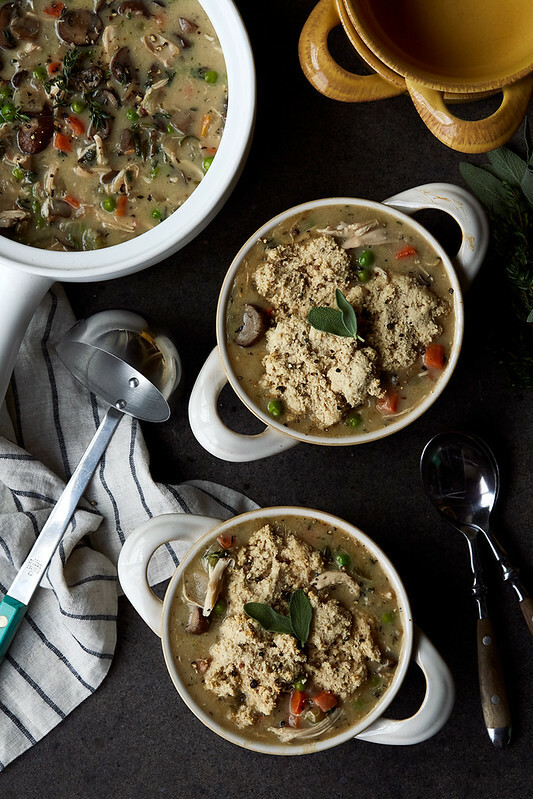 If you tend to make roast chicken often (Ina Garten style) or you grab a rotisserie bird from the store quite often, save the leftover bone and meat for this cozy, creamy, comforting soup. What I love most about this soup is the versatility of the ingredients and the add-ins. 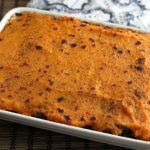 Mushrooms, onion, celery, carrots and peas are the staples for me, but if you have leftover green beans, Brussels sprouts or corn any of those would be great, you could also add cubes of roasted squash, potatoes or other root veggies at the end. 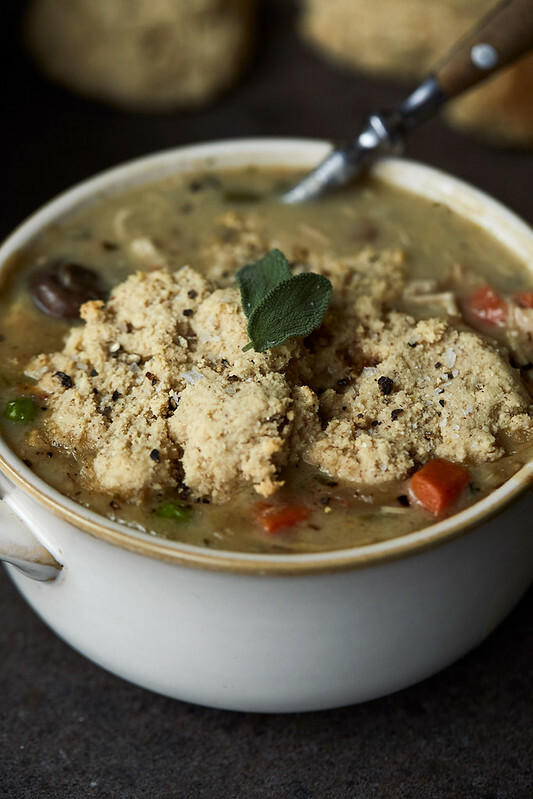 The cassava flour drop biscuits are a breeze to throw together and you can either bake right on top of a ramekin or crock full of this creamy, rich soup or if you prefer, drop them on a parchment lined baking sheet and baked them independently to serve along side this soup. Take ¼ cup of the room temperature or chilled broth and whisk in the arrowroot starch to create a slurry. Set aside. In a large heavy bottomed stock pot, heat the oil or ghee over a medium-high heat. Add the onions, celery and carrots. Saute until they are just barely tender, about 5-7 minutes. Add the mushrooms and continue cooking for another few minutes. Add the fresh herbs and the chicken. Pour in the remaining broth. Bring to a boil and reduce the heat down and allow to simmer for about 10 minutes. Add the peas and any other frozen or pre-cooked veggies. Whisk the arrowroot slurry to bring it together and then whisk it into the pot of soup along with the coconut cream. Mix well to combine and allow the soup to simmer just a few minutes longer, while it thickens. You can also use tapioca, potato or corn starch in place of the arrowroot starch. Arrowroot starch will thicken the soup beautifully, but when reheated it will thin out a bit again. 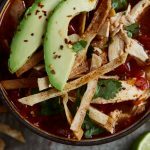 So if you plan to have leftovers of this soup, either opt to use another thickener or note that you may need to add a little more starch when reheating to keep the thickness. You can either purchase coconut cream as it is, or buy full fat canned coconut milk and place into the fridge for several hours to separate the cream from the water, open carefully and scoop out the solidified cream. The amount of coconut cream in each can varies. 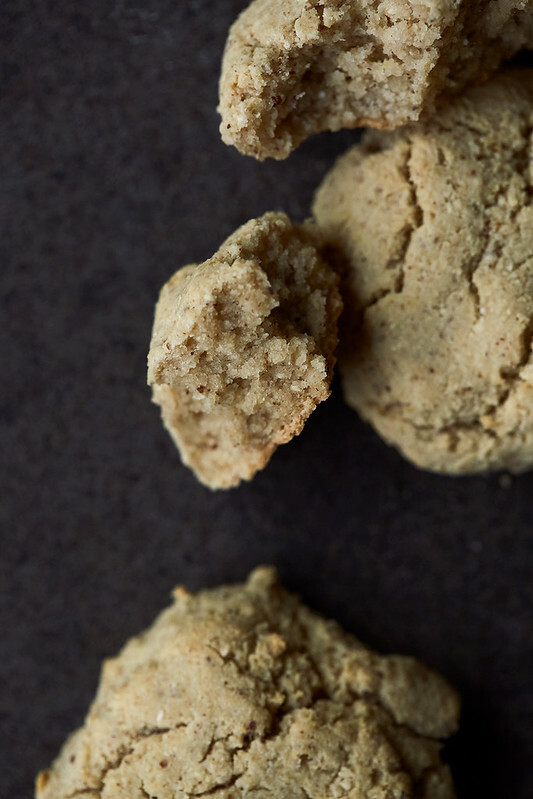 Preheat oven to 425ºF and line a baking sheet with parchment paper if making drop biscuits. If making soups, arrange 6 ramekins or crocks on a baking tray, ladle soup into them, filling about ¾ of the way. Add dry ingredients to a large mixing bowl, whisk well to combine. Whisk wet ingredients to combine. Add the wet ingredients to the dry. Mix well to combine. 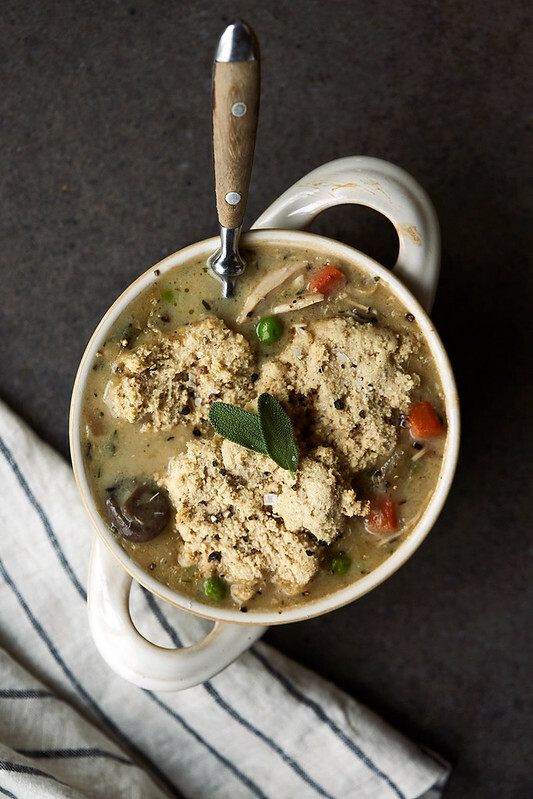 Bake for 10-12 mins.The biscuits along on the baking pan may take longer and the cooking time on the soups will vary based on how big the blobs of dough are on top of your soups, so check often. I’m glad I made dumplings for dinner tonight or I’d be drooling all over my computer! These look so scrumptious – yum! I can see the mushroom flavor in your soup and with those herbs it would taste delicious. Great idea for left overs! The drop in biscuits look interesting too.